The Melvin Jones Fellowship (MJF) is a recognition by Lions Clubs International Foundation (LCIF) for dedicated humanitarian services. 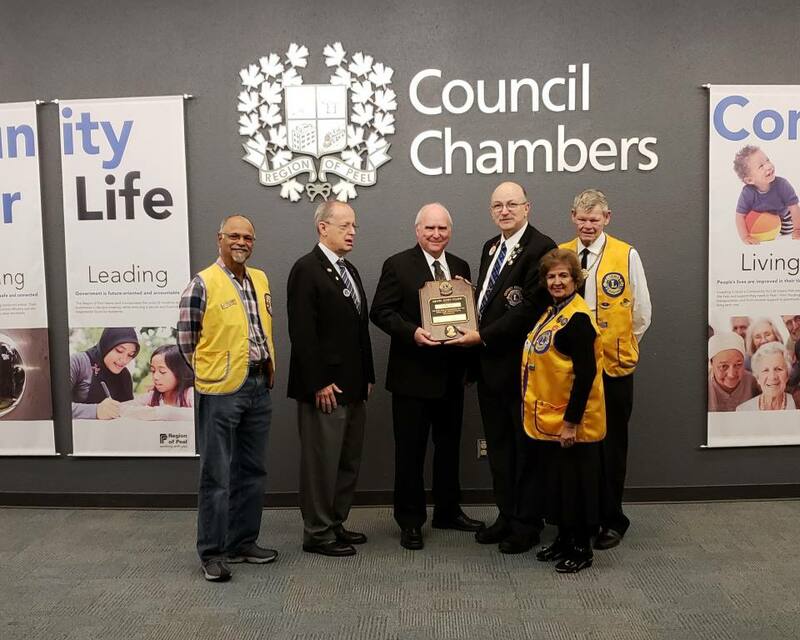 On Tuesday October 16, 2018 members of our Lions Club presented outgoing Peel Region Chair Frank Dale with a Melvyn Jones Fellowship in thanks for the many ways he has helped serve our club our community. Principal amongst his aid was his assistance in securing our Lions Farmers Market locations in the city. He was there to assist as our market moved at least six times in his time in office. Frank's term as Peel Region Chairperson will end shortly, prior to that role he served as city and regional councillor for Ward 4 in Mississauga for more than 26 years. Frank Dale was a regional employee in the region’s property department before he entered politics. We wish Frank well in his future endeavours. 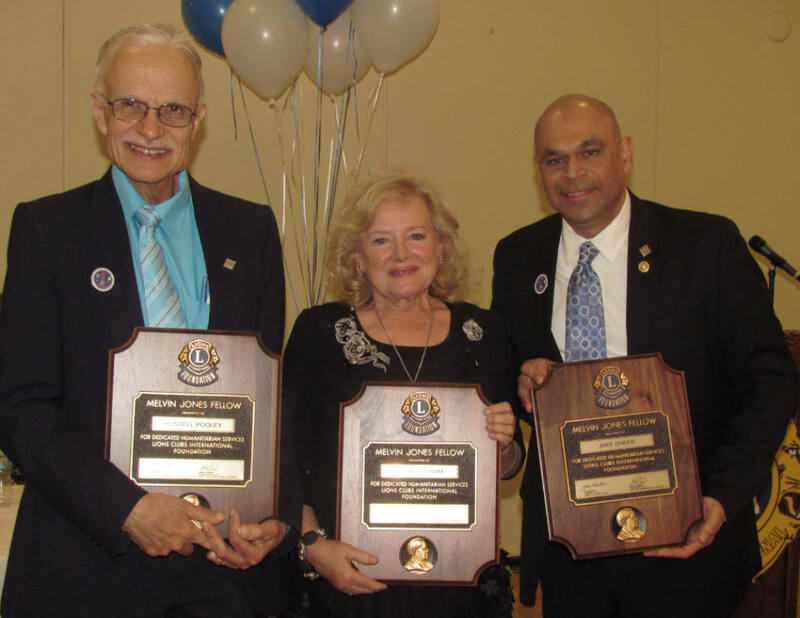 At the club's 40th Anniversary Celebration on Saturday March 14, 2015 the club recognized three members of our community with Melvin Jones Fellowships. Pictured above are those three recipients; from left to right they are: Russ Pooley, Lynn Culham and Jake Dheer. Russell Pooley served the City of Mississauga well in the role of Community Development Coordinator for many years. He has been a tireless and visionary community worker and leader, a passionate advocate committed to inclusion of all citizens and to community engagement. Many non-profit Community Organizations and Community Centres of the city have benefitted from his wisdom and guidance. Russell successfully nurtured a number of community initiatives including the Square One Older Adult Centre, the Mississauga Carassauga Festival of Cultures, the Malton Festival, the Sash Begat Festival, the Can-Sikh festival, and many more Community Centre’s that benefited from his assistance include the Burnhamthorpe and Mississauga Valley Community Centres. Russ Pooley worked closely with the late Lion Lewis Lawrence and other members of the Mississauga Central Lions Club, Nance Macdonald of Square One Management, and a dedicated team of community leaders after a two year consultant study identified the need for a centrally-located seniors’ recreation centre. Their work resulted in the opening of the Square One Older Adult Centre on October 2, 1992. Russ has assisted our lions club with our Farmers Market, including the latest extension of the Market to open on Mississauga Celebration Square. Lion Manny Castellino, the current General Manager of our Farmers Markets, greatly appreciates the assistance Russ has provided. Russ is thoughtful, mindful and infinitely practical and a stalwart friend of the community, local cultural organizations, and the Lions of Mississauga. Lynne Culham has been a founder and manager of The Open Door a small organization which has made a huge impact with the needy and less priviledged in our community. The Open Door at Square One is a front-line ministry outreach, of the churches of Mississaug,a that has been ministering since 1974. The Open Door serves people from every background and walk of life. They make every effort to minister to people’s practical, spiritual and emotional needs. They minister to people facing unemployment, critical illness, homelessness, marriage breakdown, abusive situations, bereavement, loneliness, single parenting and countless other reasons that cause people to need help. The Open Door is a volunteer-based organization. They operate with a core volunteer staff of staff of 3 coordinated by Lynne with over 100 hundred additional part time volunteers. We recognize Lynne with this fellowship for her perseverance and commitment to her ministry. To understand the impact of her ministry just look at it’s impact. They had over 21,000 visits to The Open Door in 2014. The majority of the visits were for crisis situations but over 6,000 included visits to their food cupboard, over 250 people attended their free Christmas dinner and approx. 170 families were provided with turkeys and gifts in their homes. Jake Dheer is a man of many hats, and he wears them really well. He is a graduate of film and television production at Humber College and is now the Station Manager for Rogers TV serving the Dufferin-Peel Region, is a Past Chairman of the Mississauga Board of Trade, is a community activist who has held and or continues to hold leadership roles with several organizations including the United Way of Peel, Mississauga Mayors Gala committee, Interim Place, Peel Children’s Aid Foundation, Community Living Mississauga and the Credit Valley Hospital Foundation just to name a few. Jake was also a founding member of the Carassauga Festival which has now been going strong for approximately 25 years. Jake is also a former Lion member of our Mississauga Central Lions Club. Jake has also been the recipient of several awards and recognitions over the years, such as Mississauga’s Citizen of the Year, the Paul Harris fellowship from Rotary International, Queens Diamond Jubilee Medal to name a few. Jake has often been the keynote speaker at numerous events around the greater Toronto area such as convocations and addressing new Canadians. The Melvin Jones Fellowship recognizes donations of US$1,000. It is the backbone of LCIF, providing 75 percent of the foundation's revenue. As recognition of humanitarian work, a MJF is an honor presented to those who donate US$1,000 to LCIF or to people for whom a donation was made by others. The Mississauga Central Lions Club has made significant contributions to LCIF including a single donation of $US25,000. made to Campaign SightFirst II. This allows us to recognize deserving members of the public as well as club member.